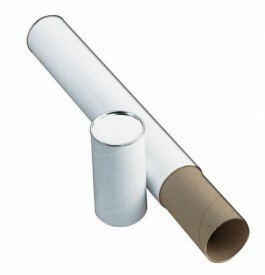 3 inch White Telescoping Mailing/Storage Tube - GS Direct, Inc.
20% off Low Discounted Price! These attractive white pasteboard mailing/storage tubes are an economical storage or mailing container for drawings, tracings, maps, charts, blueprints, negatives, sensitized paper, etc. Strong jute fiber stock, tight slip caps, reinforced metal ends.